View More In Fish Finders & Depth Finders. The wifi range coverage of OP-WIFF51 is up to150M/492ft(Use Wireless Signal Amplifier,if not,the range is 50M/164ft) and can connected with the maximum of 5 devices ,but only one can be operated at a time. With selection of 12 languages and powered by 3.7V built in rechargeable lithuim battery. We are always backing up our products for one month free exchange or a full refund if it's defective, including one year repair warranty. 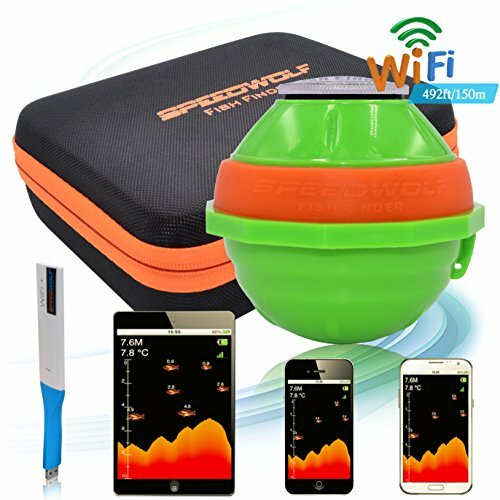 With WIFI range up to 150M/492ft，Can be used as a fish finder and a depth sounder, Built-in Water Temperature Sensor. 45M/130ft Wide Wireless Operation Range,and 90-degree beam angle. Display Water Temperature in °C or °F,and Audible fish and depth alarm. And Display Fish Icon and Live-Update Water Bottom. Support Ios/Android smartphone and tablet. Can be used in ocean, river or lake powered by 3.7V built-in lithuim battery. If you have any questions about this product by SPEEDWOLF, contact us by completing and submitting the form below. If you are looking for a specif part number, please include it with your message.